Kafé Neo, which opened in 2013 seems to have jumped on that 'rustic chic' bandwagon (if you don’t know what I’m talking about think lots of wood, unfinished brickwork and bare lighting) which is so popular in cafés now very early on. The aforementioned brickwork and lighting, very plain and rustic. I like that clock though. The humble décor and rustic colour palate seems to reflect the simple menu - which I take as a good sign. Hopefully it means that their food is simple and honest, with a focus on quality. 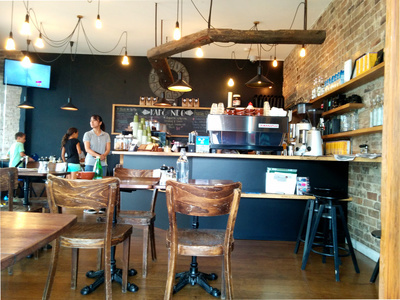 Located along a major thoroughfare it’s a bit loud at Kafé Neo; the whine of speeding cars on the road competing with the whistles and bumps of the coffee machine. It's a bit disappointing on a lazy Saturday afternoon meant for chilling out. Fortunately, Neo makes up for its noisy location with its food and drinks. 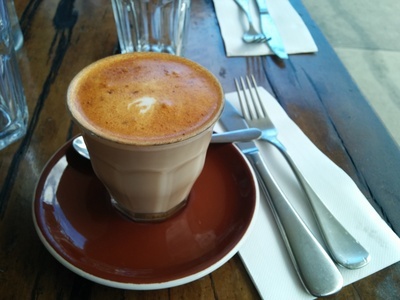 The chai latte is an interesting beast and is generally easy to get wrong. With no actual coffee, it's pretty much spiced, frothed milk. What makes it delicious is the complex combination of spices used and the subtle sweetness which accompanies it. Many cafés present customers with an under spiced, oversweet version, so I was happy to find that Kafé Neo is not one of those cafés. If you haven't ever had a chai latte, I recommend you try one. It's especially comforting on cold winter days. The Tim Tam smoothie ($6.00) on the other hand, is very sweet and is sure to bring out the indulgent 6 year-old in all of us. It's just like drinking liquid Tim Tams - whoever thought of it is genius. 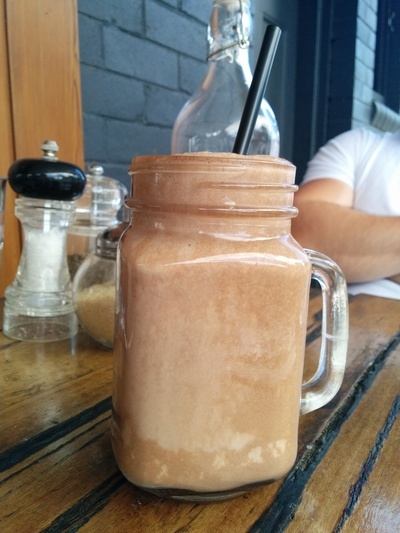 The Tim Tam smoothie is just one of a few tasty flavours on offer. The glorious Tim Tam smoothie. Need I say more? Luckily, it doesn't look like Kafé Neo has a time limit on serving breakfast, because after 1pm, a hamless (my request, the standard comes with ham) eggs Benedict ($15.00) was placed in front of me. 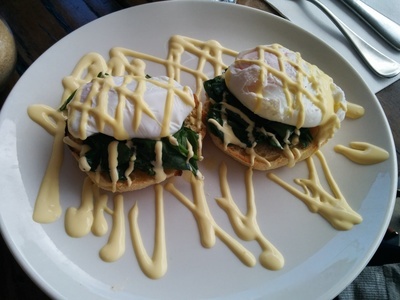 It looked fantastic, with poached eggs placed on a bed of spinach and drizzled with creamy hollandaise sauce. It tasted almost as good as it looked with only a small problem in consistency - one egg quite runny and a bit undercooked while the other was perfectly cooked, with a gel-like consistency in the yolk. My half-naked eggs Benedict. The real thing comes with ham. 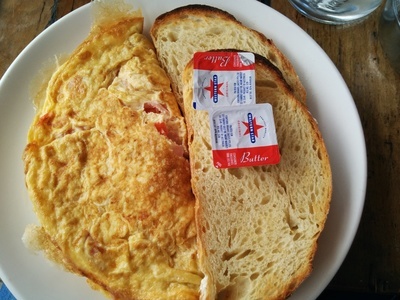 Neo’s omelette ($12.00), served with a large piece of toast, is moist, with mouth-watering melted cheese in between layers of fluffy egg, with a piece of sourdough on the side. The pieces of tomato sprinkled throughout add extra flavour and a bit of tartness. A cheesy omelette to satisfy any appetite. Kafé Neo was a nice surprise and makes for a great suburban café with good food and coffee (they use Campos coffee beans). Most importantly, the staff are all accommodating and friendly. Where: 58 Rocky Point Road, Kogarah, 2217. Cost: $5 - $25 per person. When: Monday - Friday from 5:30am - 15:30pm. Saturday and Sunday from 5.30am till 4pm.